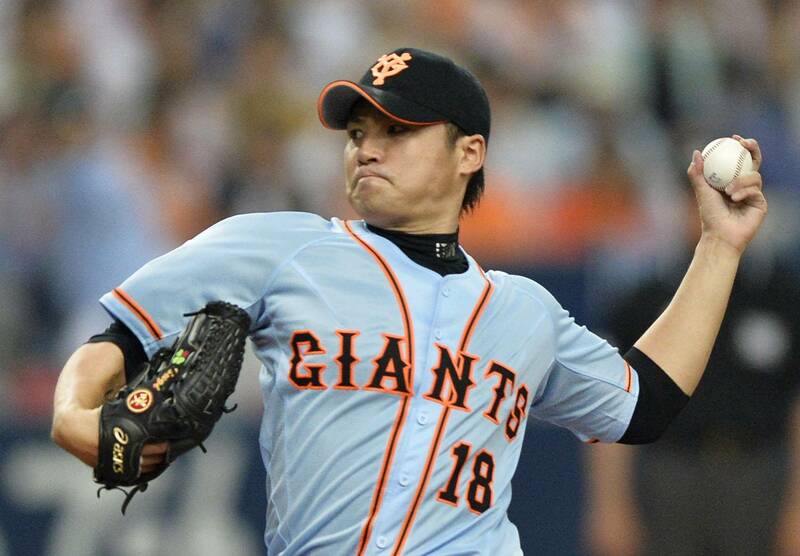 OSAKA - Yomiuri lefty Toshiya Sugiuchi allowed four hits and one run over 5⅔ innings and helped his own cause with an RBI infield single as the Giants beat the Orix Buffaloes 2-1 on Sunday afternoon for their third straight victory. The Giants beat Pacific League-leading Orix by one run for the second day in a row at Kyocera Dome. It was the first time since sweeping the Yokohama BayStars in three games on April 1-3 that the Giants won three straight. “In a tight game like this, we toughed it out and had luck on our side,” said Tatsunori Hara, whose father passed away due to heart failure on Thursday night. Yoshiyuki Kamei, who homered in Saturday’s 12-inning victory, opened the scoring on a fifth-inning RBI double. Sugiuchi drove him in from third when he beat out a high chopper in front of the plate with two outs. His single came one pitch after Shuichi Murata was tagged out by the catcher because Sugiuchi failed to get a bunt down on a suicide squeeze. “I wanted to get one run in for us somehow. 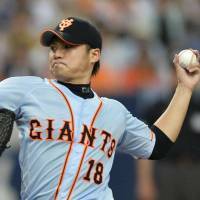 It felt great,” Kamei said of his hit down the right-field line. Sugiuchi (5-2) struck out seven and walked three. Five relievers pitched in with Scott Mathieson working the ninth for his ninth save. Brandon Dickson (5-4) yielded two runs and seven hits in 6⅔ innings of the loss. “The pitchers are playing the central role for our defense. Everyone is fighting together,” said Hara. Orix managed a run when reliever Satoshi Fukuda issued a bases-loaded walk to Ryoichi Adachi in the sixth. 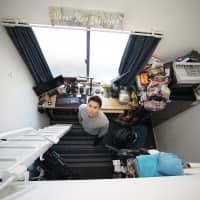 At Kobo Stadium Miyagi, Ryosuke Kikuchi broke a 1-1 tie with a fifth-inning RBI single and Bryan Bullington (7-4) limited the damage to one run and five hits in seven innings as Central League-leading Hiroshima downed Tohoku Rakuten. Rainel Rosario hit a two-run blast off Travis Blackley (1-1) in the sixth. At Sapporo Dome, Takashi Toritani opened the scoring with a one-out bases-loaded walk in the third inning and cleanup hitter Mauro Gomez followed with a bases-clearing double as Hanshin snapped a three-game losing skid in a win over Hokkaido Nippon Ham. At QVC Marine Field, Yokohama’s former closer Shun Yamaguchi (1-1) threw two-hit ball over six innings in his first start in seven years and four relievers combined in a four-hit shutout of Chiba Lotte. Hitoshi Tamura hit a third-inning RBI single off Takahiro Fujioka (3-2). At Seibu Dome, Masahiko Morino went 3-for-5 with a homer and four RBIs as Chunichi overcame a three-run deficit to beat Pacific League-cellar dweller Seibu. Reliever Shinji Iwata (1-0) went two scoreless innings for the win. At Yafuoku Dome, Tokyo Yakult catcher Yuhei Nakamura had a game-tying double in the seventh inning and the score remained that way until the game was called a tie after 12 innings. Fukuoka Softbank’s Nobuhiro Matsuda appeared to have won it with a home run when his liner hit the top of the center field wall in the bottom of the 12th, but it was ruled a double upon video replay.